Philippe Laurent is a lawyer at Marx Van Ranst Vermeersch &amp; Partners (MVVP), a Brussels-based independent law firm. He advises clients on Intellectual Property (copyrights, trademarks, patents...), and Information Technology law matters, such as online contracting, IP use on the Internet, E-commerce, as well as data protection issues. His practice encompasses a wide range of commercial law matters as well, including any form of distribution (exclusive distributorship, agency, franchising agreements,...), promotion and advertisement of goods and services and consumer protection compliance. He usually advises businesses in the software development &amp; services, information processing, advertisement, media &amp; entertainment and online commerce sectors. Philippe is also senior researcher at the Research Centre - Information, Law &amp; Society (CRIDS) of the University of Namur, where he specializes in IP licensing. He has worked extensively on the legal aspects of FOSS, and is currently working on the development of a local FOSS expertise centre. Philippe is also alternate member of the copyrights and neighbouring rights section of the Intellectual Property Council of the Belgian Ministry of Economy (SPF Economie) and is appointed by the CEPANI as Third-Party Decider for &quot;.be&quot; domain name disputes. Co-organizator of the annual European Opensource and free software Law Event, Benjamin Jean is currently the inno³ company's CEO, an open innovation consulting firm focused on IP and project management . He also works as lecturer at Sciences Po Paris, teachs IP in several Masters and as consultant within the Gilles Vercken Law firm. Benjamin Jean is author of a new book “Option Libre. The good usage of Free Licences” (http://framabook.org), co-author of the “Open Source Guide” professional whitepaper published by the Syntec Numerique and is involved in several working teams about open source and Open Data governance and/or licensing. 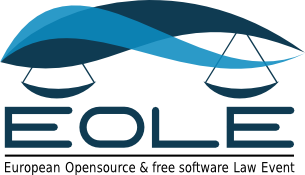 During it past position, he created the first CJOS (Open Source Law Center) He also co-founded, a few years ago, a French (community) project, named Veni Vidi Libri, which aims to inform creators and developers about free/OS licenses and to help them using free licenses. Malcolm Bain, partner at id law partners, Barcelona, specialises in Information Technology law and Intellectual Property law. He has a wide experience representing clients on both sides of IT transactions, with a special focus on the legal issues of open source software and content. He has participated in various R+D projects and written and lectured on many aspects of IT law, e-commerce and internet regulation. His pro bono activities include participation and advising several free and open software projects and communities. Based in the London office, I am a director in the TelTech team at Wragge & Co. For more than 10 years I have focused on technology-related matters. Particular areas of expertise are managing major IT procurement projects and advising on the legal issues associated with free / open source software. Karen M. Sandler comes to the SFLC after working as an associate in the corporate departments of Gibson, Dunn & Crutcher LLP in New York and Clifford Chance in New York and London. Sandler received her law degree from Columbia Law School in 2000, where she was a James Kent Scholar and co-founder of the Columbia Science and Technology Law Review. Sandler received her bachelor's degree in engineering from The Cooper Union. She is admitted to practice in the State of New York. She is also an officer of the Software Freedom Conservancy. At present, I work with Open Source licensing at the Technology Licensing unit of ST-Ericsson in Lund. I provide support to the R&D, Product Management and Sales organisations on various Open Source issues, with focus on license compliance (GPL, LGPL etc), contributions to open source communities and open source strategies. In addition, I handle licensing negotiations on strategic software sourcing contracts. Previously, I was Attorney at Law at Advokatfirman Vinge (a top Swedish law firm) for more than six years. The focus in my practise there was on antitrust law, technology licensing and general commercial law. Mr. Peterson has practiced as an intellectual property attorney since 1983, primarily in the information technology industry. He joined HP in 1991. His current activities focus on two areas: open source software and standards setting. Since his first advice on the GNU General Public License in 1992, Mr. Peterson has provided legal advice on free and open source software licenses for a wide range of projects. He has been counsel to HP's Open Source Review Board since its formation in 2001. Mr. Peterson has provided legal advice concerning the development of standards since 1996, initially in the context of specific business activities and in recent years in development of HP policy. He has testified several times (in 2002 and 2007) on issues at the intersection of standards, intellectual property, and antitrust. Mr. Peterson received bachelor's and master's degrees in electrical engineering from the Massachusetts Institute of Technology and a juris doctorate from the Frankin Pierce Law Center. Laurent Baudart remplace Francis Jubert en tant que délégué général de Syntec informatique, la chambre professionnelle des sociétés de conseil et de services informatiques, des éditeurs et des sociétés de conseil en technologies. Laurent Baudart, 42 ans, ingénieur EUDIL et titulaire d'un MBA (Ecole Supérieure de Commerce de Paris), compte 20 ans d'expérience dans le secteur informatique (équipement, services et logiciels) et les télécommunications. Il était jusqu'à présent en charge de la direction de la ligne métier Services aux Infrastructures puis du développement des services en Europe chez ECS Solutis.